HardyCHROM ESBL is a selective chromagenic medium for the primary screening and differentiation of extended-spectrum Beta-Lactamase in Entrobacteriaceae (ESBL). The selective components are agents that inhibit the growth of yeast, gram-positive bacteria and gram-negative extended-spectrum beta-lactam-sensitive bacteria (eg, a cephalosporin). The presences of chromagens allows the differentiation of Enterobacteriaceae that producte ESBL. 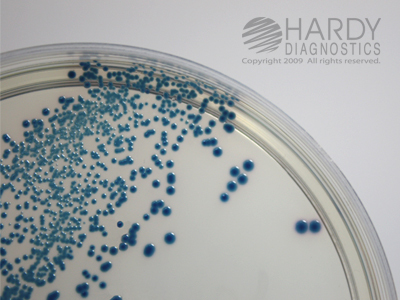 The colones of those bacteria release products when they use the chromagens as a substrate source appear coloured. Proteus and Morganells spp. produce clear to light yellow colonies with golden-orange halo diffuesed through surrounding media.